Great idea, Melissa. I love it, especially rolling the candles in Epsom salts. BTW, Epsom salts make great rose food. I sprinkle 1/4 cup around each rose plant 2x per year and my roses zoom. .-= Michelle, Home Staging Pro´s last blog ..Giving Back – Holiday Gift Ideas =-. Love these ideas. Stopping in shaw’s tomorrow for salt! you inspired me to fill my empty mason jars with my leftover epsom salt and put candles in them. what a wonderful place blogland is. .-= Emily@remodelingthislife´s last blog ..Where Memories Are Made =-. This is SUCH an inspired and wonderful idea…I love easy, inexpensive DIY projects…thank you so much for sharing! 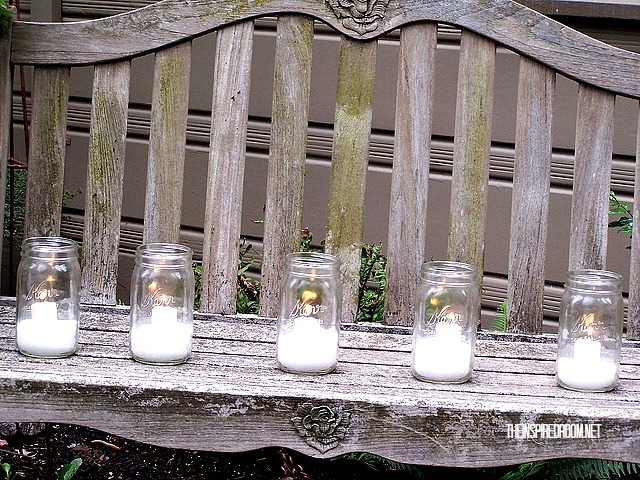 I love your idea for candles on the porch! What a simple way to make a high-end statement! .-= Sarah from pewter+sage´s last blog ..Real Rooms: Mom and Dad’s Holiday Decor =-. Great ideas! I’m putting epsom salt on my grocery list! .-= Aimee´s last blog ..Jack’s First Cut =-. oh shoot that’s simple and lovely! I will do this with some large jars I have. .-= The Tiny Homestead´s last blog ..I’m thankful for…. =-. Oh, we just made Peppermint Candy bath salts for teacher gifts this year and these Epsom salts look sooo lovely spread on a mirror with a few different sized candles for a centerpiece too. I loved Emily’s idea and yours too- so creative and frugal!! Ah, Holiday Decor right up my alley…easy!! Candles rolled in salt, who would have thought?! .-= Janell Beals´s last blog .."Happy Holidays" + Another Great Special =-. Ohhhhh fabulous ideas! So simple! I’m definitely doing this! .-= Julia Stainton´s last blog ..Something Wonderful =-. .-= Anna See´s last blog ..Which Smells Worse? Snapfish or 3 day Old Fish? =-. Wow – really great ideas. I may have to try this this weekend! .-= Jocelyn Stott´s last blog ..From Eeek! to Chic =-. How totally awesome to use Epson salt in these creative ways! 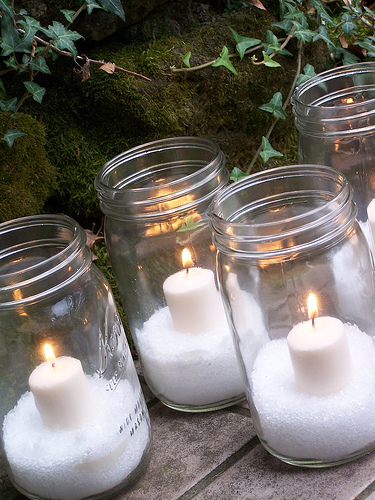 I adore the simplicity of the little white candle and Epson salt in mason jar! .-= Teresa´s last blog ..FOOTBALL…It’s a Tradition! =-. I was just going to say that I only recently saw epsom salts being used in another way for Christmas and it turns out to be your friend! I think this is a great idea and it does look sparkly! .-= Misty´s last blog ..I’m Back!!! =-. .-= Tamara´s last blog ..Vivaldi, Handel and Mel Torme……A Great Combo! =-. I love this idea!! so easy too! What a great ideal, I have never thought of using Epson salt. This is one I will use. It will look great outside since I am using all whites and silvers to decorate with. Thanks for sharing. Hope you stop by soon. LOVE both of these ideas!!! .-= Barbara @Southern Lady’s Vintage´s last blog ..Pink Christmas! =-. That is a lovely AND easy idea.. by the way, your pics are beautiful. .-= Rocio@CasaHaus´s last blog ..The So Called Foyer =-. That is brilliant! Love the “snow”! .-= Jess @ Frugal with a Flourish´s last blog ..Cyber Monday Roundup =-. ps. I don’t have mod podge on hand… do you think craft glue would work or is that a fire hazard? .-= gina´s last blog ..little vignettes… the story of their lives =-. Pretty cool, I never thought about using salt. . .
.-= Mod Podge Amy´s last blog ..Project of the Week #69 – Odds n’ ends rack. =-. I’m going to be stopping at the store for epson salt! I have some containers that I wanted to put some “snow” in. Now I know what to use! Thanks for the awesome idea, I’m looking forward to more ideas!! .-= Kim´s last blog ..Bring Back the Red!! =-. What a great idea…using epsom salts and the look is really cute. Think I’ll use some of my old green Ball jars, that should look festival as well. .-= Sandra´s last blog ..The Christmas Season =-. Oh, so cute! I have Epsoms salt, ball jars and tea candles already! This is a great idea. Thanks for sharing! .-= Robin´s last blog ..Met Monday- Hurricane Globes =-. Thanks for sharing such a beautiful idea… I’ve got a ton of Epsom salt – Costco stock! I love them! I made some like Emily’s a few weeks ago, and I added a bit silver glitter in with the salt. Sparkle, sparkle, sparkle! .-= living with lindsay´s last blog ..A Wreath Re-Do =-. What great and simple ideas….I’m sharing this with my facebook friends, so expect lots of “hits” on your site! .-= Tammy´s last blog ..A Simple Christmas =-. What great ideas! I’m totally going to do that with my candles-thanks for sharing! .-= Gina´s last blog ..An Encounter =-. Beautiful idea! Thank you for sharing! .-= Sara´s last blog ..It’s the most wonderful time of the year…. =-. Very cool ideas! Love the “snow” in the mason jars. .-= Nancy´s last blog ..Tour of Ornaments =-. Those candles are very cute rolled in the salt. I think I have some salt in my pantry – maybe I was going to cook with it? Also, I have a snow scene in a sealed mason jar that I was given years ago and I’m pretty sure the “snow” is epsom salt! .-= Abbie´s last blog ..The decorating begins. =-. Great uses for salt! Who would’ve thought? .-= Kendra @ MyInsanity´s last blog ..Are You Ready for December? =-. Would have never thought of that, how clever!!! I’m sure a bit of prism glitter would add even more sparkle! .-= Violet´s last blog ..White on White =-. OMG I love blogs such great and simple ideas everywhere. .-= Pat’s Addition´s last blog ..Vintage Stockings Saga =-. I’m loving it all, Melissa! Off to the supermarket for Epsom Salts for me. You’ve got Christmas off to such a beautiful, inspiring start. Meredith xo. .-= Meredith´s last blog ..Nachos Sweet Child of Mine Dip =-. This is such an inspired and wonderful crafty idea….i can’t wait to try it…thank you! .-= Stephaine @ Geezees´s last blog ..Destination Canvas…. Where have you been? =-. Love this idea, I’ll definitely be using it. Saw Emily’s post last week, and I’ve already got the Epsom salt from that project. .-= Christi´s last blog ..i heart faces =-. 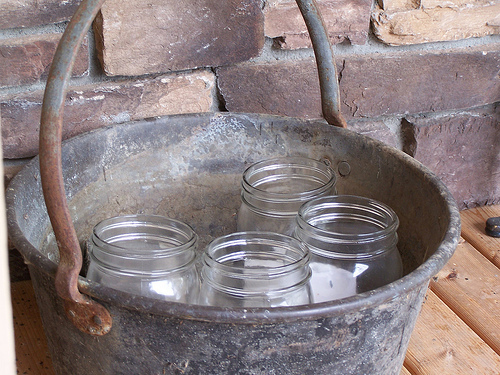 I do this too, except I use my blue mason jars, love the idea! And I plan on trying those candles too, I saw them last week. .-= Liz@HoosierHomemade´s last blog ..Cupcake Tuesday ~ Christmas Cupcakes =-. This idea is wonderful and looks so pretty! .-= Jackie @ Lilolu´s last blog .. =-. .-= Passementerie´s last blog ..New Adventures in Radley =-. 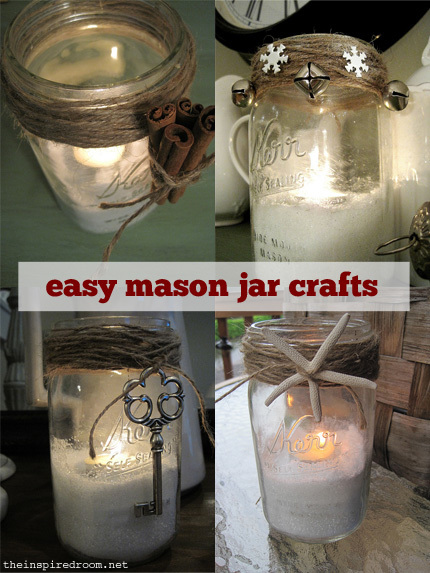 Love the Epsom Salt snow and using the mason jars. I probably have 20 mason jars lying around the house. What a great way to use them for holiday decor. Some great ideas from all the comments, too! .-= Christi from Charm & Grace´s last blog ..More artwork… =-. I have some of these! Use what you have decorating is my FAVORITE kind, thanks for the great inspiration (as always). .-= Gina @ The Shabby Chic Cottage´s last blog ..Reviving old ornaments =-. Thanks for the quick, easy, elegant tip. I just added epsom salt to my shopping list! .-= Jill: The Welcome Home´s last blog ..My Next Big Before and After =-. I’m heading off to the store :) great tip! Love this idea! I have a hunch there will be a run on Epsom salt after this post. .-= The Stylish House´s last blog ..Easy Christmas Arrangement Idea! =-. Epsom salts hey? That is Fantastic!!! I have some in jars by the bath but I never really thought of them as snowy looking before- you’re so right! On my list! What cute ideas!!! 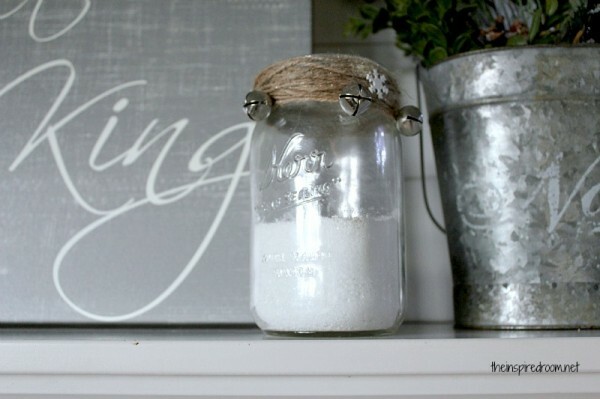 Love the mason jar “snow”! :) Very cute! What a great idea. I would have never thought to do that. I love it. .-= Melanie´s last blog ..One little corner. =-. Brilliant, I just may do with my BG’s next week. I’ll for sure link back, or better yet link to Friday. I just love jars. Love. Them. .-= Sandy´s last blog ..Our Cake Boss Girl! =-. this is a great idea! very cute! .-= Stacey´s last blog ..Cute apothecary jars =-. Thank you, Melissa! I have been in desperate need for some table decorating ideas and this gives me one! Yippee! .-= Heathahlee´s last blog ..A Dog Named…Jonathan =-. Great idea! I just recently found your blog. Love your style, thanks for the inspiration! who knew? have you ever tried epsom salts on cotton? I just bought the fake sprinkles for cotton, but if modpodge works for candles, think it might work. hmm . . .
.-= Colleen@MuralMaker&More´s last blog ..Mural Registry for Nurseries is launched! =-. Lovely, lovely ideas!!!!!! thank you for sharing!!! Thank you for such an awesome tip! I am the snow queen here in Georgia and I cant believe I didn’t know this! Now I have to rethink the whole scheme in the dining room. Oh dear. I’ve done a similar thing for years. I swirl a bit of water in the jar first and then pour in kosher salt and swirl it again. The salt will stick to the sides of the jars, but still look like snow. A pile of salt in the bottom of the jar to hold the candle and some ribbons around the top. I’ve even wrapped wire around the tops and made handles like a lantern. Fun and safe. I love to light them for my Christmas Teas as well. .-= Kimberly´s last blog ..Sally Clarkson Conference =-. What a great idea! I’ll have to try this for inside the house, outside the jars would quickly fill with “real” snow! .-= HisFireFly´s last blog ..Word Filled Wednesday – Hush =-. I love the slippies…and its ALMOST looking a lot like Christmas at my house! So simple and pretty!! I love those! I’m definitely going to buy some epsom salts! .-= Lisa @ Stop and Smell the Chocolates´s last blog ..500th Post ~ Celebrate With Chocri Customized Chocolate Bars =-. Just lovely! I linked to this on my weekly roundup, the post is under my name. Thanks! .-= Lenetta @ Nettacow´s last blog ..Link Roundup – I Smell Popcorn Edition =-. I do something similar withempty baby food jars and votive candles. The one year I didn’t have any salt handy I had a old spray can of paint for glass. So I spray painted them and tied a ribbon around the rim for a little extra pizzaz. Very pretty! When I saw the first picture, my heart skipped a beat. I kept reading and it got even better. I LOVE both these ideas. These are the first original, non-cheesy, non-tacky Christmas decorations I’ve seen on a blog all season. Thank you. I’m going to go to the drugstore tomorrow to buy some epsom salts so I can steal these ideas. .-= Meghan´s last blog ..Tree Watering Made Easy =-. What great ideas! Tx for sharing. .-= Kendra aka The Meanest Momma´s last blog ..Sounds of the Season =-. Uhhhh doing it! Both of these ideas! Love them! .-= wanda´s last blog ..Tiger….not always a winner! =-. You have solved the mystery for me! I have ben asking and wondering how I can get that pretty sparkly winter look on my candles for forever!!!!!! Thank you! I featured it on my fan page … awesome idea to share! love the ideas, Melissa! i wanted to spread the joy, so i shared them on my own blog! .-= Beth H´s last blog ..Craftastic New Blog: Make + Meaning =-. Wow, so easy and the results are beautiful. LOVE IT!! This is so great — very simple but what a statement. I’m definitely adding these to my front porch on Christmas Eve this year. Did you happen to see the Queen of the Ball Party on Between Naps On the Porch? Obviously, someone else out there loves these things as much as we do! The WHOLE party’s theme was Ball Canning Jars! How beautiful and so creative. 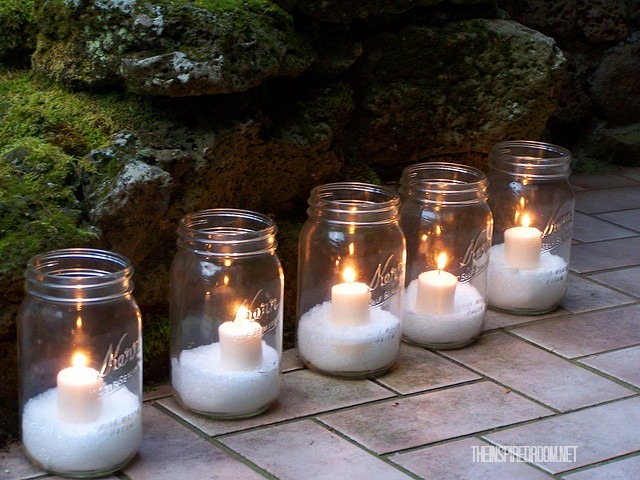 I love mason jars and I think it’s such a cool idea to put snow & candles in them. Just wondering how they burn? Do the salts melt or make it more messy? Is it safe? I’ve used the Epsom salts for maybe 6 years…no problem! Nothing happens to the salt, at worst it gets damp and hardens over time. No sticky or gooey mess! I just wanted to tell you that l loved your tutorial. I just finished 6 jars and plan to go tomorrow and get more supplies to make more. An inexpensive gift and so many different ways to decorate. I decorated mine with Christmas themes. Thank you so much for sharing. I would post my pics here if l could. I did something very similar for my niece’s sweet 16 party a couple of weeks ago–but I used food coloring to dye the Epsom salt! I’d seen a “recipe” to make glitter by mixing regular table salt with food coloring and baking it for 10 min, but it wasn’t so glittery. :( It looked more like sand, which would have been okay for what we were doing. Then I spotted the Epsom salt under the sink and the light bulb went off in my mind! I mixed in a little food coloring with it (without baking) and then added it to the regular table salt. It made some really pretty lanterns for the yard for her party! If I hadn’t already had six cups of “glitter” salt already made up, I would have went with just the Epson salt, because it was a better look for sure! I love your ideas. I am planning on a country Christmas theme this year and will be using mason jars everywhere. I have never used Epsom salts before but am going to this year. Thanks! Connie it sounds to me like the candle wax melted into the salt & as the wax cooled it got hard I would set it on top of the stove while ytour oven is on & maybe that will melt the was just by the heat just enough to get it all our If not try a screwdriver to break it up or something on that line No knife you can slip & cut yourself. Not sure about zapping in microwave as the candles usually has a small piece of medal holding the wick at the bottom of the candle. Good luck. I made the jars with the candles and Epsom salt. My candles completely melted and the Epsom salt is hard as a rock! How do I get it out of my jars? I have put water in them but it doesn’t seem to be doing anything. Any suggestions? 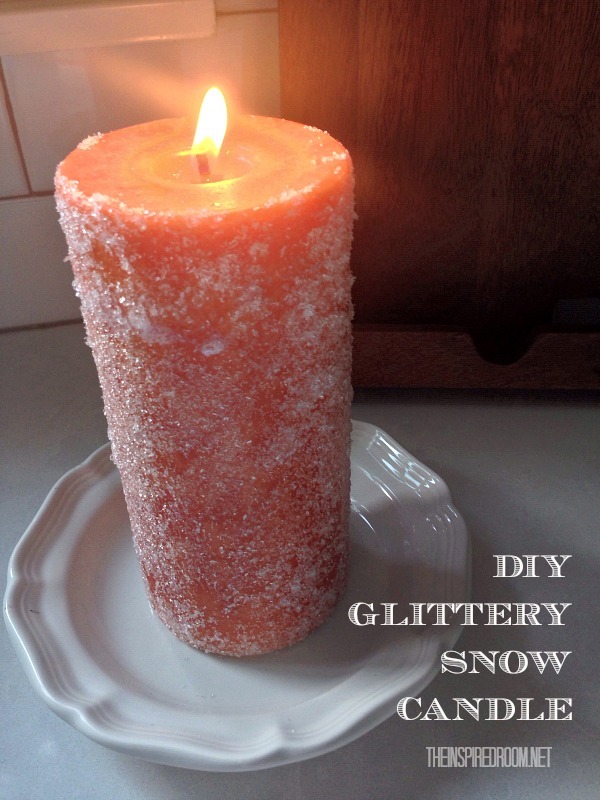 Place your candles in clear glass votive holders and then put them in the “snow”. That should solve the melted wax and hardening salt.